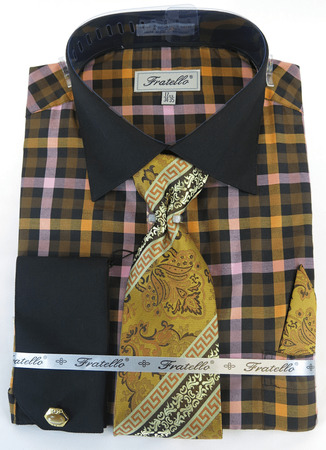 If you've been wearing men's dress shirts that come with the matching tie set and like them bold and loud, Fratello dress shirt tie sets are for you. These bold pattern dress shirts are Italian in design and attitude and for the man who isn't afraid of a little color. This black with gold plaid dress shirt features french cuffs and comes with the matching tie and hanky set for a colorful complete look that sets you apart from the dull dressing men out there. Made of cotton/poly.